They announced this a month ago but I’m hearing about it only now. For $400 you can pre-order a pair of Segway skates (or ‘personal rolling transport products’). 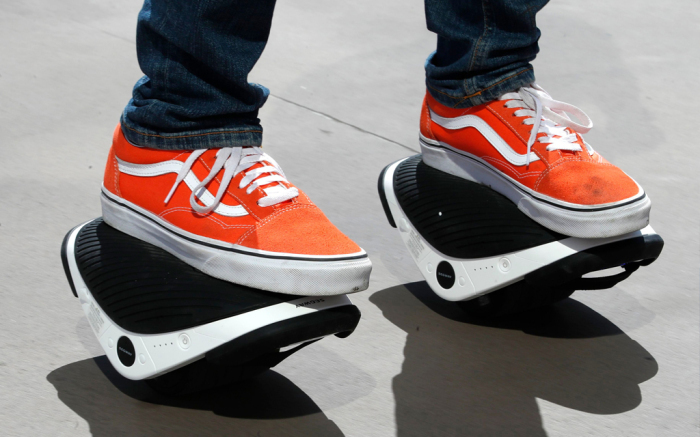 As best I can tell, there’s one wheel under each foot, and they’re like motorized Heelys, with the addition of Segway’s auto-balancing technology. They weigh about 7.7 pounds (3.5 kg) per skate, and they’re physically large enough that they won’t fit in any kind of normal backpack. Maximum speed is rated at roughly 7.5 mph and the battery lasts around 45 minutes depending on “riding” style and road conditions. This entry was posted in Such a bargain!, Why did you think this needed a motor? on July 30, 2018 by stern.